Last month, in the comments field to our Six Degrees of the Library Collection post, we were asked a question and issued a challenge. The poster wanted to know how we choose the authors that we link in our Six Degrees posts and if we would take on connecting two authors that were suggested to us. In answer to the question we usually start with an author that's in the news or that we like and then do some research into other authors they have connections with. Our posts are inspired by the Six Degrees of Separation concept but we don't start with two authors and try to connect them - we just start with one and see where we end up. Rushdie -- Booker Prize winning author of Midnight's Children. The answer was yes and more quickly than any of us expected - we were able to connect them through a single person: Queen Elizabeth II. In 1972, Tolkien was made Commander of the Order of the British Empire and in 2007 Rushdie was given a knighthood for his services to British literature. However, that connection doesn't seem to really follow the spirit of what we've been trying to do in our Six Degrees posts - which is show random connections through a range of authors and highlight some books and authors you maybe haven't heard of. Certainly in our past posts we could have connected two authors more quickly than through 6 steps, but that seemed to take the fun out of things. So, in that spirit - here are 6 steps you could use to connect Tolkien and Rushdie. In addition to his writings, Tolkien was also an important member of the Faculty of English at Oxford University, holding several prestigious positions there over a more than 30 year career. Another British author of great accomplishment who is strongly associated with Oxford University is C.S. Lewis. Lewis and Tolkien were close friends and both members of a literary discussion group known as "The Inklings". In 2002, an author by the name of Melanie Jeschke, released a book called The Inklings,in which a young American like travels to Oxford to study. The publisher describes the romantic title as "sprinkled with allusions to classic English literature, references to C.S. Lewis, and an appearance from Professor J.R.R. Tolkien himself." Like the character in Jeschke's book, Nicci Gerrard and Sean French both studied at Oxford and although they were in the same department at the same time, they didn't actually meet and marry until years later. You may not recognize their names separately, but together they write popular suspense thriller novels under the name Nicci French. Their most recent novel together is What to Do When Someone Dies. Husband and wife writing duos are more common than I realized. One of note is Susannah Kells - Judy and Bernard Cornwell; he being the well known author of numerous historical fiction titles, including the blockbuster series of Sharpe stories. The stories in this series feature a character named Richard Sharpe, a soldier during the Napoleonic Wars and are praised for their brisk paced, character driven plots. Some of the books have been adapted for a television series called Sharpe in the UK. A 2006 episode in the series called Sharpe's Challenge, features Sharpe in India and stars, among others, Indian American actress Padma Lakshmi. 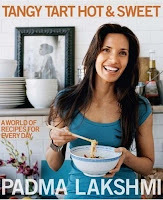 Lakshmi is probably best know to North American audiences from television's Top Chef, which she has hosted since season 2. She is the author of two cookbooks, her most recent entitled Tangy, Tart, Hot and Sweet. In 2004, Lakshmi married novelist Salman Rushdie - although the two divorced in 2007. Wow! I love it. I am indeed the anonymous query-poser and challenge-maker of last month's post and I am pleased with the results! I suppose in hindsight, two British authors might have been too easy to begin with, no doubt why they could be connected through one Royal step. But I am glad to see that you rose to the challenge anyway and connected them through six very fascinating degrees. Very well done!